Mode is one of the measures of central tendency which can be defined as follows. For a given set of observations, mode may be defined as the value that occurs the maximum number of times. Thus, mode is that value which has the maximum concentration of the observations around it. This can also be described as the most common value with which, even, a layman may be familiar with. Thus, if the observations are 5, 3, 8, 9, 5 and 6, then Mode (Mo) = 5 as it occurs twice and all the other observations occur just once. The definition for mode also leaves scope for more than one mode. Thus sometimes we may come across a distribution having more than one mode. Such a distribution is known as a multi-modal distribution. Bi-modal distribution is one having two modes. If the marks of 5 students are 50, 60, 35, 40, 56, there is no modal mark as all the observations occur once i.e. the same number of times. 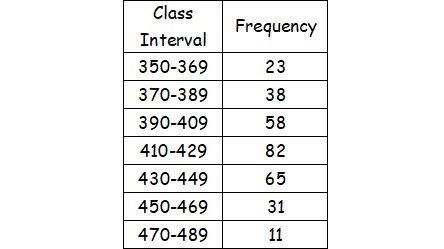 Going through the frequency column, we note that the highest frequency i.e. f₀ is 82. The above result holds for holds for a moderately skewed distribution. 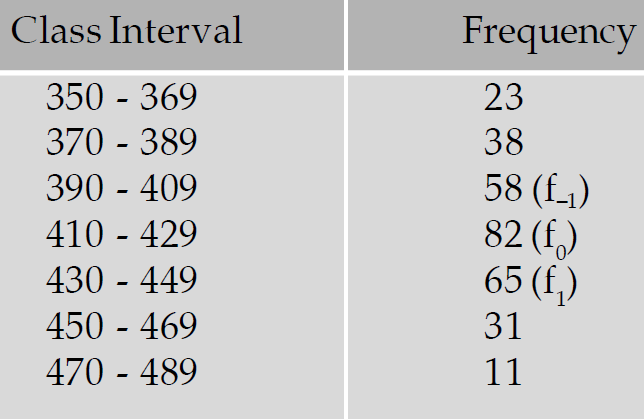 1) Although mode is the most popular measure of central tendency, there are cases when mode remains undefined. 2) Unlike mean, it has no mathematical property. 3) Mode is affected by sampling fluctuations. After having gone through the stuff given above, we hope that the students would have understood "Mode in statistics".